Are you an Extreme Couponer? Do you keep all your coupons in a physical binder? 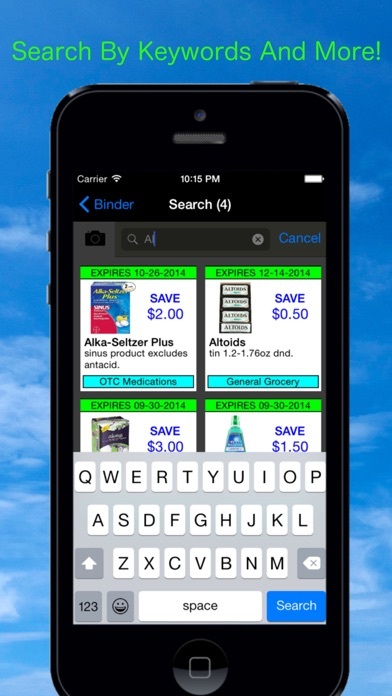 If so, "Coupon Binder" is the perfect companion App for organizing and tracking all your coupons. 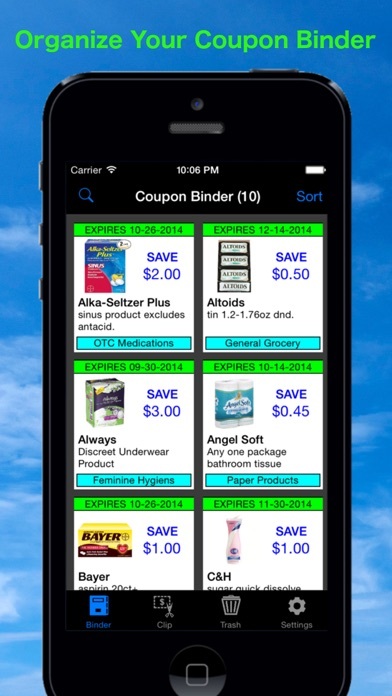 Instead of the labor intensive task of manually entering all the coupon information into your iDevice, let "Coupon Binder" perform the tedious job for you! 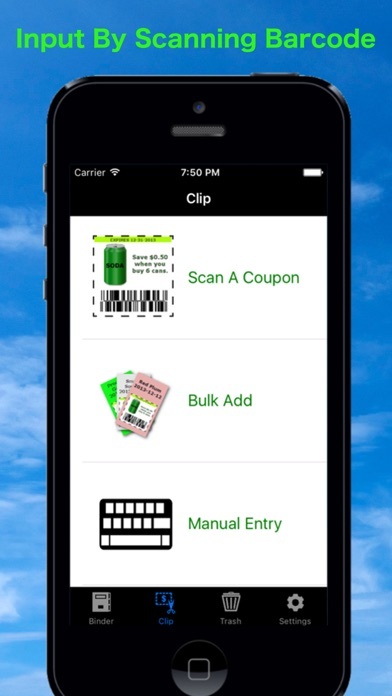 Simply use your iDevice's camera (auto-focus camera required ) to scan the coupon barcode and "Coupon Binder" will automatically load all the relevant information from an online Database. Want more? "Coupon Binder" saves you even more time by allowing you to import a Sunday-paper-insert's worth of coupons all at once. Just pick the week you want from your favorite coupon publisher such as Red Plum, Smart Source, and Procter & Gamble and "Coupon Binder" will add all the coupons from that insert for you. With a massive collection of coupons, trying to find specific coupon becomes next to impossible. Let "Coupon Binder" help you with that too! You can easily search your virtual binder by typing in simple keywords for your favorite brand (ex. "Garnier"), coupon description (ex. "shampoo"), or category (ex. "Hair"). Typing in keywords is still too much work for you? Use "Coupon Decoder" to scan your favorite product's UPC barcode at the store and it will "auto-magically" search and match your binder for potential savings. How easy is that! Act now and download "Coupon Binder" absolutely free! There is no risk in trying it out. You will get a 7-day risk-free complementary subscription when you first install the App. You can always extend your subscription anytime by going to the "Settings" section of the App. Any subscription you buy can be used on all the iDevice's you own! What are you waiting for? Questions, comments, concerns? Contact support@idearidge.com We can't help you if you don't contact us! ******************* Disclosures: 1) iOS8 and auto-focus camera is REQUIRED! Coupon Binder supports iPhone 4 / 4S / 5 / 5S / 5C / 6 / 6 Plus / 6S / 6S Plus / 7 / 7 Plus, iPad 3 / 4 / Mini / Air / Air 2, and iPod Touch 5th generation (released Oct, 2012 or later). iPhone 3 / 3GS, iPad 1 / 2, and all previous generation of iPod Touch are NOT supported. 2) Online database (internet connection required) currently contains data for Sunday paper inserts about 6 months from present date. 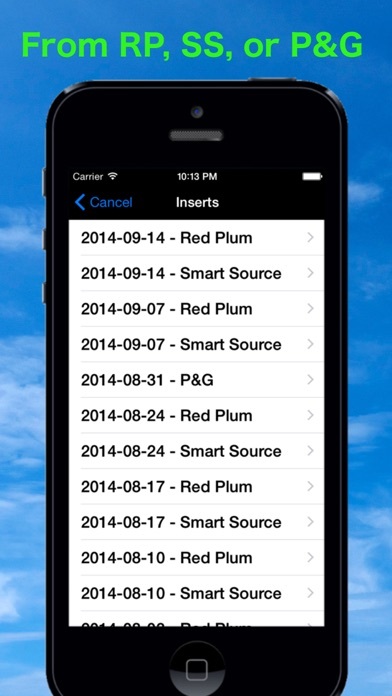 All future contents are generated both by the App publisher and your fellow Extreme Couponer! If you are the first person to see a new coupon, data you enter may be used to share with the rest of the community. 3) Red Plum, Smart Source, and Procter & Gamble are NOT sponsors of this App. There will be regional difference with the availability of coupons and potential savings. This means that while some coupons may shows up in the master database they may not be available in your local region. 4) Product UPC matching is a "fuzzy" match. This means the search algorithm will not always be 100% correct. It will mostly likely find the coupon from the manufacture of the product you are scanning. Search function will NOT work with manually entered coupon. Manufacture ID (which is embedded within the coupon barcode) is needed for UPC matching to work. 5) Subscription transfer requires you to create an optional account (free). You may loose your subscription purchase if you reset your device before creating an account. You can associate your account up to 10 devices per Apple's standard practice. 6) Yes, you still have to carry your physical manufacture coupons. By law, third parties are not allowed to reproduce coupons (even digitally). Moreover, your local grocery store still need the physical coupons in order to get reimbursed by the manufacture. Any other App that tells you otherwise is breaking the law! You can only use the trial version but that’s it, you can’t extend it past the first few days. Makes me wonder if they just want you to down load it on your phone so they can pull information off of it. Couldn't add a coupon. Add photo took me to a blank screen. Scan coupon wouldn't work either, did turn on my camera light... not even sure what Manual Entry was.. Hopefully newer version improves. 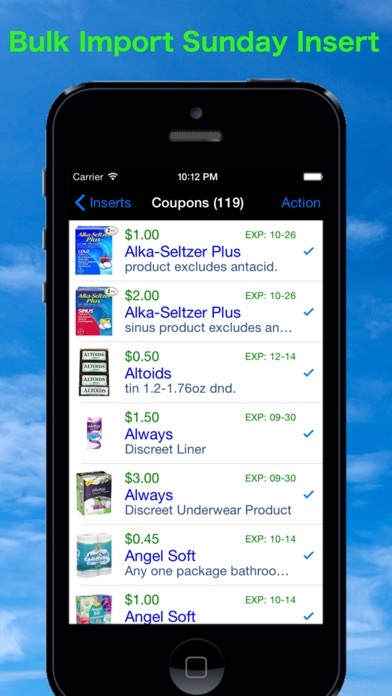 I've been searching for an app that would let you download & save coupons into your iPhone Passbook (such as P&G) instead of having to print them or carry around a binder. I thought I'd found it, then I realized that this app does no such thing. It is only a duplicate of whatever you have in your physical binder. Ultimately, you still have to haul around & dig through paper coupons. Couponing is tedious enough, no point in doing twice the work for nothing! Not to mention, those of us frugal enough to clip coupons & keep binders generally do NOT want to pay for something that we are already doing on our own. I spent hours getting my coupons organized just to find out my "free trial" that I clearly didn't realize had "expired" Don't waste your time unless you want to pay! It's a trial. 😠 Next time, I'll read the small print. I like the idea of being able to flip through a "file" if you will when planning my excursions. This has multiple problems. 1) expiry date wrong when scanning. 2) not organized in virtual Binder I wanted an app that I could use to see what I had for coupons in conjunction with sales. love the app! super quick to upload coupons & easy to use. customer service is AMAZING! soooo helpful!! quick responses & simple instructions on any questions I've had so far. definitely recommend!